I’m always amazed by the mind-blowing visual effects in today’s movies, but I know rendering these effects is one of the most complex aspects of a cinematic production. It is hard to find the right infrastructure, set-up a render farm comprising of high-performance compute clusters, and then manage it. Additionally, with advancements of technologies like 4k and 8k on the horizon, even small projects can take anywhere from days to weeks to complete. The cloud is perfectly suited for variable length and long-running rendering projects. Today, I am excited to announce the preview of Azure Batch Rendering. Teaming up with Autodesk, Azure is opening doors to artists, engineers, designers, and developers. Built on top of Azure Batch, a mature and production service, this new rendering platform will allow you to seamlessly submit rendering jobs utilizing Autodesk’s suite of products with the agility, flexibility, and scalability of Azure compute. Autodesk’s software is the industry standard in Media & Entertainment, Architecture, Manufacturing, and Automotive for creating visual effects, animation, and photo-realistic images. Products like Autodesk 3ds Max, Maya, and the recently acquired renderer Arnold are widely used creation tools. Most users in the CG industry share the challenges of scaling rendering jobs across hundreds or even thousands of nodes with the complexity of license servers, dongles, configuration, data conversion, and pipeline. All these factors often make it extremely difficult to adopt the cloud as part of a production pipeline. Azure Batch offers a highly available, cloud-scale job and resource management service. Batch takes care of all the heavy lifting associated with job scheduling/queueing, managing failures, retry policies, and auto-scaling. With Azure Batch Rendering, we have integrated rendering capabilities into the Azure Batch job service. 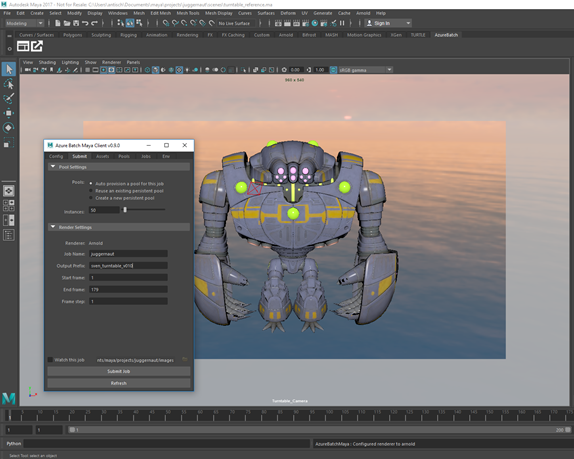 You can now submit on-demand jobs using Autodesk Maya, 3ds Max, and Arnold without any need for managing licenses or infrastructure and paying only for what you use. Furthermore, by using the new cloud-optimized versions of both Maya and 3ds Max, you can cut down on your data movement by not having to export scenes locally. This will dramatically reduce the time required for jobs to complete. Over time we will be supporting even more rendering applications as part of the platform. In addition to these new capabilities offered by the rendering platform, we are also releasing an SDK supporting multiple languages for integrating with your custom pipeline to automate render workflows. Furthermore, we are releasing a set of open-source plugins directly integrating into Maya and 3ds Max. 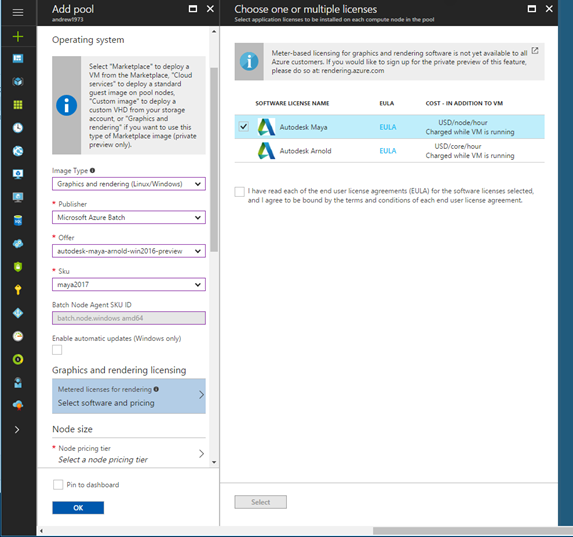 These plugins provide an easy way to get started with your rendering jobs in Azure and integrate directly with the Azure Batch API. With the plugins, you can control how you manage your render farm in Azure, including automatic job scaling or static management of resources. We have open-sourced the plugins to enable you to contribute new features, provide feedback, and modify components for individual needs. The rendering platform will allow you to have flexible access to the VMs rendering your frames or shots. Thus, you can easily monitor the jobs and tasks with diagnostic logs from the renderers being used. We want to remove all barriers you may have to run complex rendering jobs by eliminating the pain of managing resources and allowing you to focus on your creative projects. Azure Batch Rendering is available today in preview. Over the next few months, we will work with customers and partners to improve and refine the platform. We would love your feedback on this new service. If you want to participate in the preview, please visit https://rendering.azure.com.